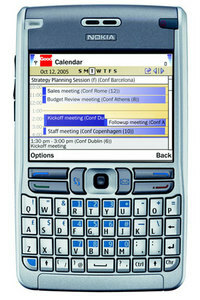 Nokia E61 is high-end business email Smartphone device that aims to compete with Blackberry as alternative. Nokia E61 features advanced email capabilities such as Microsoft Word, PowerPoint and Excel (of Microsoft Office 97, 2000, XP and 2003) viewer and editor which compatible with Zip Manager and Adobe Reader, multi-tasking ability, and offline mode support. E61 also has up to 64MB of user memory, full QWERTY keyboard with backlight, 2.8″ 16M colors within 320 x 240 pixels TFT LCD, miniSD card slot and runs on S60 (Symbian Series 60 3rd Edition) Smartphone platform. E61 also supports WLAN, WCDMA, EDGE high-speed data, Bluetooth, and quad-band GSM. Other phone features are speakerphone, full HTML web browser, speaker-independent voice dialing, push email, device lock, device wipe and music player. Mobile Game Faqs reviews Nokia E61 and concludes that Nokia E61 is one of many smartphone options available from T-Mobile and it’s clear that it’s an alternative to the BlackBerry – or the company’s own branded Vario range – rather than a replacement. The real crux of whether you choose the E61 over the BlackBerry or the Treo isn’t down to services, as they both offer a similar package, but whether you prefer the screen, the keyboard and the overall look of the hardware. For us, while Nokia has succeeded in not creating a device that is like its Communicator handset (i.e., a brick) we have to say we do prefer the software interface and keyboard layout of the BlackBerry over the Nokia. But that isn’t to say that a Nokia user wouldn’t prefer the software over and above the BlackBerry or Palm offering. A solid phone that offers plenty for the business user afraid to leave the comfort of the Nokia interface. TechWorld concludes that “this is a phone we would be happy to call our own. It has limitations – it is large at 69.7mm wide by 117mm deep, and at 144g quite heavy, and is also too business-like to include a camera. But these are all by-products of its virtues”, and has buying advice that this is smartphone that makes a lot of sense as a device for mobile email and other tasks, as well as providing a platform for Wi-Fi based mobile VoIP and other new ideas. It’s somewhat heavy and large, but that goes with the territory: overall, good value for money. Check out also review of Nokia E61 by OSNews.